Beckman-Coulter Allegra 6R Refrigerated Benchtop Centrifuge w/ Rotor . 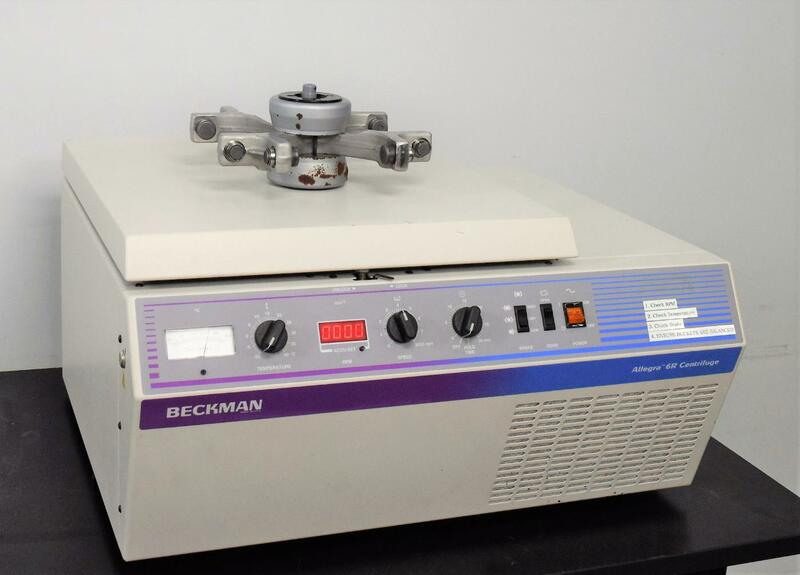 New Life Scientific, Inc.
A time-tested classic, this Beckman-Coulter Allegra 6R centrifuge was tested and serviced by our dedicated centrifuge technician. With its included GH 3.8 swing-bucket rotor (No buckets included), this centrifuge is ready for use in your lab. Though it shows slight signs of use, we are confident in its functionality. In the words of our tech, the Allegra 6R series is “old but gold”. This unit, having been manufactured in 1999, is no exception. Fully-functional and ready to spin, this centrifuge needs only buckets and adapters. Our technician ran this Allegra 6R at the rotor’s max RPM of 3,750 RPM and found no problems. The machine meets the manufacturer’s cooling specification of -10°C. Our technician also replaced the filter and blew out all the dust inside the machine. The g-forces the centrifuge exerts are just as real as those exerted by a new one. Buying pre-owned can save you more than 60% of what you would have spent buying new.